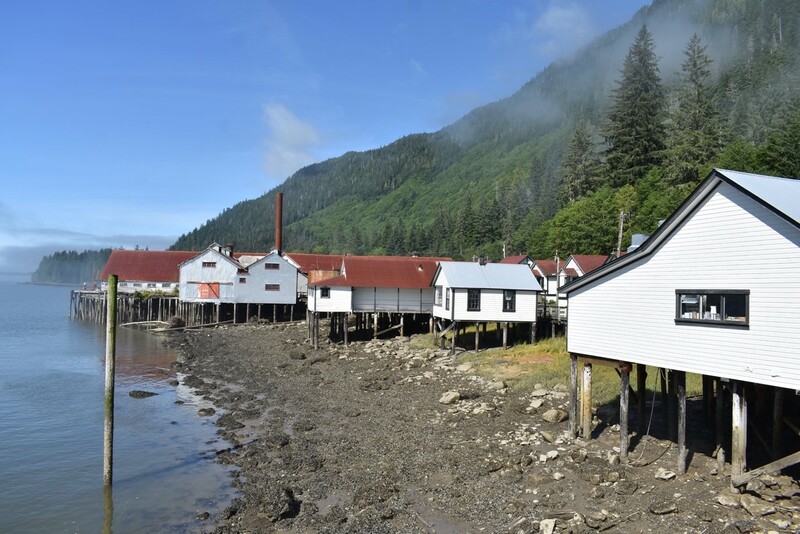 In late August 2017, I taught an experiential and service learning course at the North Pacific Cannery in Port Edward, BC, a former salmon cannery and now a national historic site. Sixteen history majors from the University of Northern British Columbia travelled 700 km from Prince George in central BC to the north Pacific coast at mouth of the Skeena River. 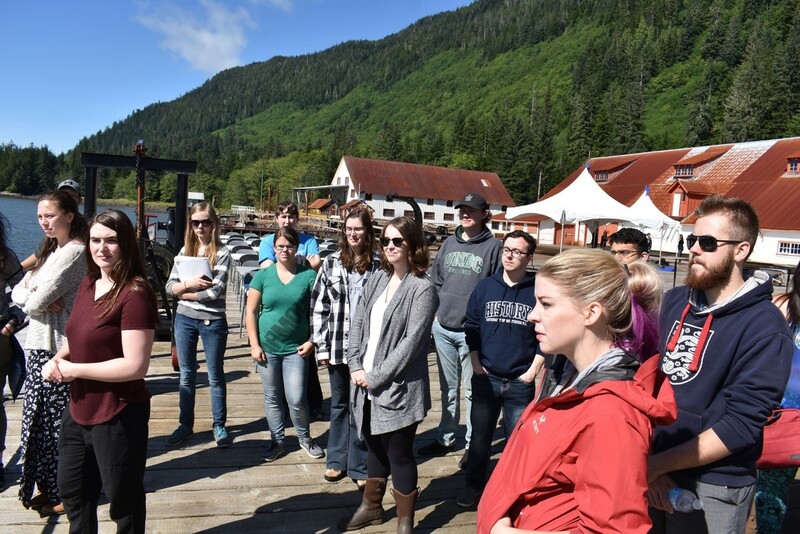 Students learned about labour, migration, and environmental transformation in British Columbia and the Pacific world, and the experience of being on site gave them new perspectives on public history and community engagement. That engagement was driven both by a desire to bring the university to the communities it serves (in UNBC’s case, essentially the northern half of British Columbia) and by a conviction that we can do more to help undergraduates convert the abilities acquired in the humanities into marketable skills in the world after university. In sharing some of my experiences from this course, I hope colleagues elsewhere will consider undertaking similar activities themselves. During the six days we spent living at the cannery, students and I toured the site, discussed with the director her expectations of us, and contrasted in seminar discussions the historical narrative presented at the cannery with the material covered in the academic readings. Students spent two days in archives, either at the cannery’s private archive or at the Prince Rupert City & Regional Archives, and the better part of another day hearing from Aboriginal elders, cannery workers, and a union representative in a sort of oral history roundtable. Like any fourth-year seminar, I assessed students based on both participation and their writing. Yet as an experiential learning course, both of those tasks differed from the traditional classroom. Participation involved not only contributing to seminar discussions but also asking questions during the tour, taking initiative in the archive, chatting over lunch with various stakeholders, or giving a brief presentation with me to about 25 people from the community at the Prince Rupert public library. Students submitted an annotated bibliography of all of the readings on our first morning in Port Edward, they carried out research during the week, and they completed two assignments over the course of September. For those whose final project was a podcast, students and I attended a podcast making workshop at the CFUR student radio station once back in Prince George. For the first writing assignment, students prepared articles based on original archival research, and their brief histories can be found on the course website. For their final projects, students chose between making a podcast, writing or greatly revising Wikipedia articles, or making a museum exhibit (roughly five panels) with images, quotations, and a historical explanation of a specific topic. Students documented the course and showcased the cannery and our activities in a collaborative Instagram project as well. In these assignments, the course transitioned away from experiential learning and to a service learning and public history course. As one of only two experiential learning courses offered by my department, this course built on and benefitted from students’ previous experience in more conventional university classes. Students applied the skills acquired during their time at UNBC to projects outside the university, and they mobilized research and writing skills to add content to the national historic site’s website. Students’ research and writing on workers’ rights, racial segregation, First Nations families, Asian immigration, female workers, and evolving environmental regulations broaden significantly the narrative presented at the site. The site’s director (Laurie Davie) asked students to focus their attention on Japanese-Canadian and Chinese-Canadian labourers because there was very little coverage of these two groups, a noteworthy omission considering their very large roles in cannery workforces in both the Fraser and Skeena canneries from the 1880s to the 1950s. While several students did take up this torch, having sixteen researchers allowed for a great diversity of topics, all of which cast new light on underrepresented subjects. Teaching an experiential learning course required both students and me to shift our approach to the study and discussion of history. As a colleague wisely advised, it should be experience for the sake of experience. Researching in an archive, giving a talk at a library, or taking a tour that does not fully square with information in scholarly publications were all experiences that helped students get a better grasp of the writing of history, historical memory, and community engagement. 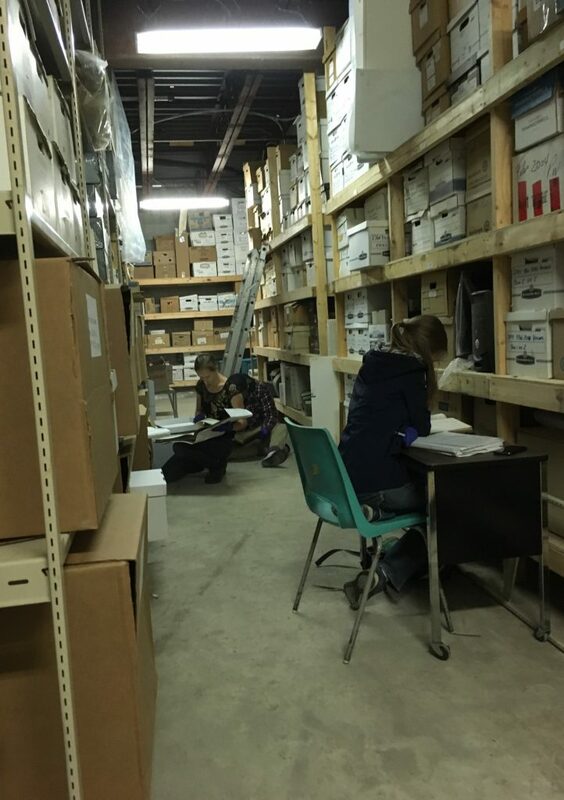 In Port Edward, students found themselves in the dusty basement of the Port Edward district office (city hall), with unlabelled boxes documenting various aspects of the North Pacific Cannery’s history. I must admit that this archive was one of my own most rugged archival experiences. And the students loved it. The visiting archivist, Heidi Rempfl, up from her regular job at Gulf of Georgia Cannery in Richmond, BC, started the students off by handing them a box and telling them to write a paragraph describing what was in it. She and I decided that this task would help the cannery with its current project of cataloguing its materials. The vast majority of the cannery’s collection consists of numbered but undescribed boxes stored in a small room off a larger garage where the district office also stores piping, a motorcycle, and topsoil. 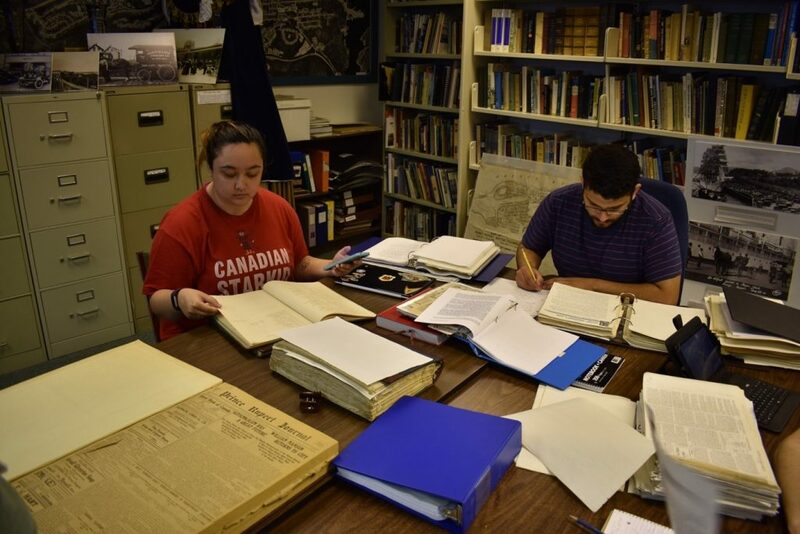 Five students found themselves in the far more organized Prince Rupert City & Regional Archives, but they were similarly overwhelmed by the possibility of hundreds of research topics and simultaneously limited to the documents they could find in a single place. The students all agreed that they now look at and appreciate a history book or article in new light. Several told me that it was one thing to read a historical pamphlet ordered through interlibrary loans, download a PDF from Archive.org, or read microfilm, but it was quite another thing to spend hours digging through papers and trying to find a needle in a haystack only to find a pot of gold on another topic that they did not know existed and that they suddenly had to work through before the archive closed. History majors at any university would have trouble graduating without having written papers based on primary documents. But far fewer would have experienced “the thrill of discovery” – to borrow the slogan from the Archives of Ontario – that one gets by discovering new topics by accident or finally uncovering what one was looking for after hours of sifting through documents. In this digital age of searching for and ordering specific documents, few students experience the creative and seemingly limitless opportunities afforded by sitting in a room with stacks of boxes around them or by a good old-fashioned finding aid. For an experiential learning course to really work, the learning needs to move in many directions. Students learn from the professor and fellow classmates, and we all learn from the people we meet on site. The professor also learns from students. For instance, on our last day, students suggested that next time I ditch the seminar discussions of the readings altogether; instead groups of students could lead classmates on walking tours where the student-teachers explain the important points that they read about in specific readings and but that gained new value by actually seeing the space and imagining the history. Teaching a course off site required a lot planning, organization, and the willingness of a community partner to host a large group of students. Condensing the 39 hours of instruction into a single week (with the readings done before and the assignments after) was intense. Yet what the students (and the professor) learned and how they learned it has – I think – enriched the overall learning of a group of UNBC students. Student travel and accommodation costs were covered by the Undergraduate Experiential and Service Learning Award, generously funded by UNBC donors. Benjamin Bryce is an Assistant Professor in the Department of History at the University of Northern British Columbia. He is the author of To Belong in Buenos Aires: Germans, Argentines, and the Rise of a Pluralist Society (Stanford, 2018) and co-editor of Making Citizens in Argentina (Pittsburgh, 2017) and Entangling Migration History: Borderlands and Transnationalism in the United States and Canada (Florida, 2015). I am so happy to see that UNBC is reaching out again to the regions for inspiration and students are given opportunities for creative assignments and to participate in the fabulous historical places and people. Thanks for the great report.